I’ve often heard of the Butterfly Effect, and while I knew what it meant I didn’t know exactly know from where the name came. I was given this book as a gift for my high school graduation, so I was excited to finally learn more about this concept. I really like the historical references in this book, especially the one about the Civil War. Apparently there was one soldier who largely influenced the outcome of the Battle of Gettysburg, thus causing a turning point for the United States in this extremely important conflict. I had never heard about him before reading this book, even though I took a course in United States history two years ago. I love fun facts like that! This little book contains many examples of how people’s small and seemingly insignificant actions have changed the world in very big ways. With each example it goes back in history several generations to fully show how past actions really do impact how we live today. These are all extreme scenarios, of course, but the basic idea is what’s important. 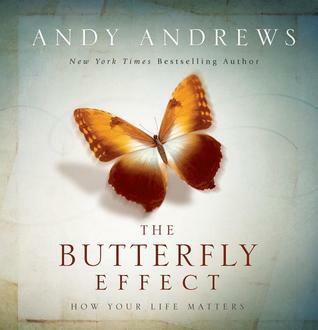 The Butterfly Effect emphasizes that every life, every action, every word matters. Who knows what kind of impact you could be making on the world around you each and every day? My only problem with this book is that it’s so short! It feels like there’s hardly anything to it, because as soon as I started to get used to the format of it the book ended. I would have liked it more if the author had elaborated on certain examples or provided more personal anecdotes to support the message he was trying to deliver. Overall, The Butterfly Effect presents an incredibly important, inspiring message that I think everyone could benefit from understanding. Although I did enjoy reading this book, it just wasn’t substantial enough for me to actually love. Perhaps I would have liked it more if it was the size of a normal book rather than its smaller size. I received this as a gift, which I think is a lovely idea! I wouldn’t have bought if for myself, but it was still nice to read. Would I recommend it to a friend? : It depends. If I had a friend who was experiencing a big transition in his or her life (a graduation, going to college, moving, an important birthday, etc.) then I might buy it as a present. But I’m not really sure I would recommend it to them as something to simply buy from a bookstore and read. < Previous Top Ten Tuesday: Author Spotlight! Next > Packing for College: Supplies Haul!